But does this really work under water? What are the benefits for freediving? Are these features necessary or even disturbing? 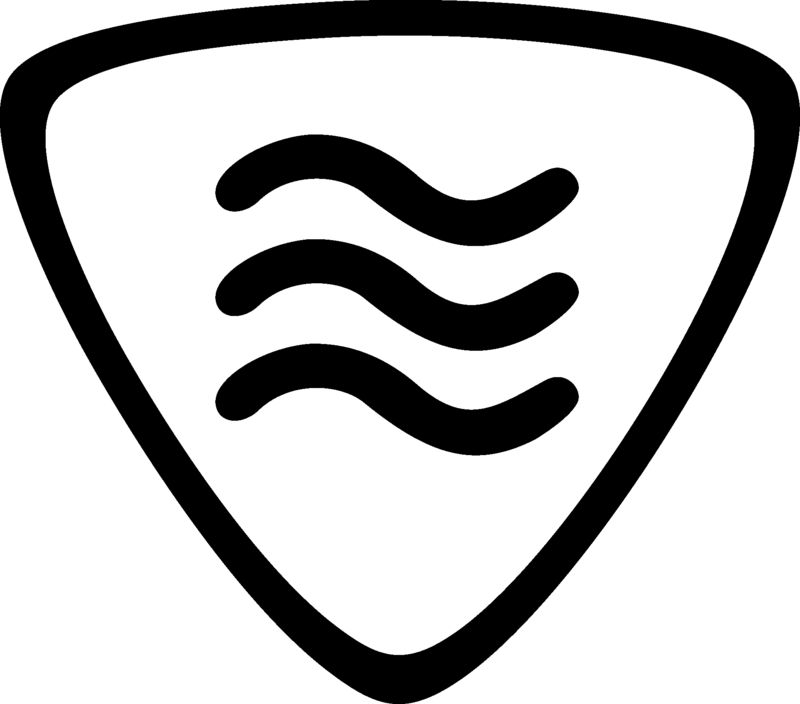 A while ago I was asking on many different platforms which features a new dive computer should have for freedivers. 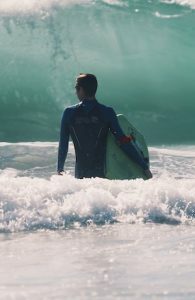 Within this review I do my best to answer all these questions and report about my first tests freediving the Descent Mk1. Garmin asked me for my test-results to improve features to fit for freediving. So some things are on the way to get adjusted. To put my hands on the Descent Mk1 I spend a day at the Dive4Life in Siegburg, Germany. The pool has a max. depth of 20m, which I consider a good start for the first tests. Let’s see if the Descent Mk1 can proof Garmin’s promise. The Descent Mk1 comes in 2 Versions. The Silver made from steal with a silicon wristband and the Premium Black made from titanium with a titanium wristband. Both versions are very good manufactured, a real high quality product. I don’t even feel the watch on my wrist. The silicon wristband fits well from the beginning on. Garmin offers other wristbands in colors from green to red and a leather band too. The wristband can be replaced within seconds. You just unclip and change it within another wristband. The clip works out just fine and makes it easy to replace or enlarge the wristband. 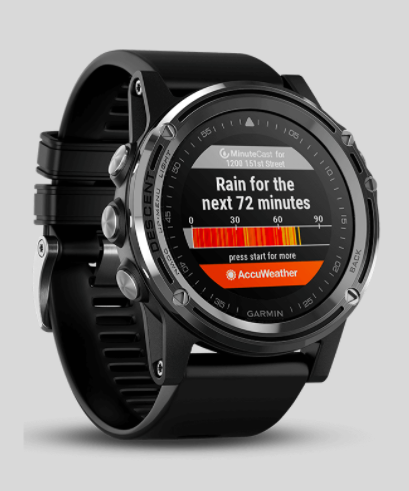 Garmin provides the Software “GARMIN Connect” which is available as a online interface as well as a free App. 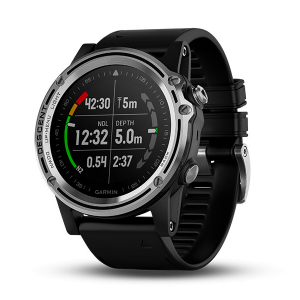 The Descent Mk1 is based on the Fenix 5X and brings all of its functions + now the new diving functions, so it just words. Well done. 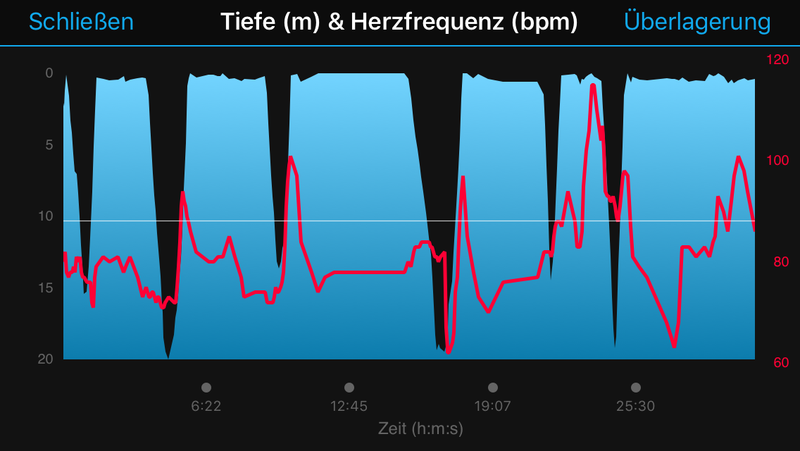 I came out of the pool, switched my Bluetooth on and tadaaa, had access to my diving profil and all other tracked data. Here is no computer needed to synchronise, only to set up the Garmin Connect-Account at the beginning. 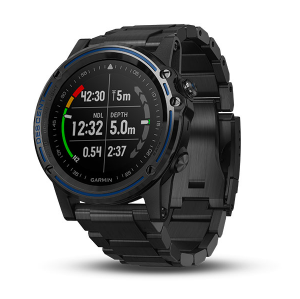 A big plus is the possibility to get updates via Garmin Connect for the Descent Mk1. If and when there are updates available. Additional you can set up your dive modes on your computer or smartphone. A fact that I really enjoyed is that I can track a whole training in 1 file. Like that I see my surface intervals, the total training time and I can overlay my heart-beat + water temperature to this file. Here you see the file with depth, time and heart-beat. All these notifications can be set together or alone. For example a sound at 10m, a vibration at 20m and another vibration and sound at the bottom. I tried 10 notifications and I could have set more. There are even surface-time-alerts to set, which can be good for a specific training. → You need to leave the Apnea-Mode to reset the alarms. In that case a new file will be recorded. Normal with other computers, but this can be improved. As you see in the pictures, it really works. Sure, it needs a connection to my wrist to get the heart-beat. The sample-rate is 1 per second and it doesn’t work when I put the computer with the sensor on my neck and under my hoodie, but ok.
→ If it is possible to increase the sample-rate to 2 or 3 measurements per second? → How about vasoconstriction when I’m diving deeper? This will be tested on the next review when I’m getting back to the sea. The battery recharges quickly and lasts in the normal watch-mode, without tracking my sleep, for 15days. In diving mode it should be 40h, which is quite long and needs to be tested again. The Descent Mk1 comes with a clip where you can fix and connect it via USB to recharge wherever you want to. The GPS needs some time in the beginning to track where I am. In the first time it can take up to 20min. Afterwards we talk about 0,5-2minutes. As it is a coloured display, the maps are good to see. Same as on a smartphone, just a smaller screen. With the GPS you can mark points on the surface, to get back there or share the spot with others. So when you want to get back, the navigation can lead you back. This works only on the surface, but underneath you can use the integrated compass. Tables are not included in the Apnea-mode. To track your training in the pool it is possible to switch into the Swimming-mode to see your dive(swim)-time, turns and total distance. It is adjustable for the Apnea-Mode to leave the light on while diving. The mode provides 5-100% brightness & there is one button only for light. When connected to the smartphone it becomes a smart-watch and can send you notifications for weather, rain, moon and meetings via your calendar. 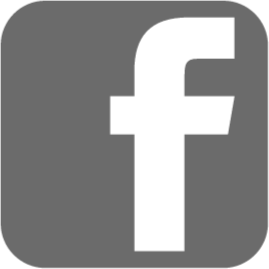 There are free downloads in Garmins Connect IQ-Shop to individualize your display design. 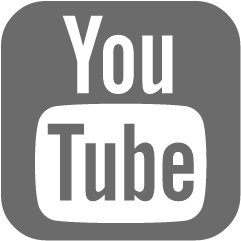 In both directions you can see live how fast you move. If you need more details go to Garmin Connect afterwards and zoom into your dive-files. In the beginning I was sceptical and had some doubts when Garmin announced a new dive computer. But my first impression while freediving is better than expected. I see a lot of potential for ambitious training, usability and safety when Garmin keeps adjusting some details and can add the tables for the nitrogen saturation. In general it is pricy with 999€ but if you’re looking for advanced training, a fitness watch, navigation more or less a watch for daily use, the Descent Mk1 can be the right match for you. - Can the heart-beat be measured below 20m? 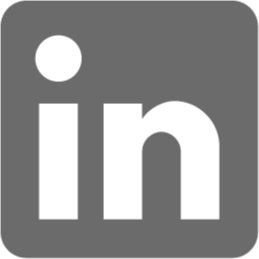 - Could it be possible to measure O2-Saturation? 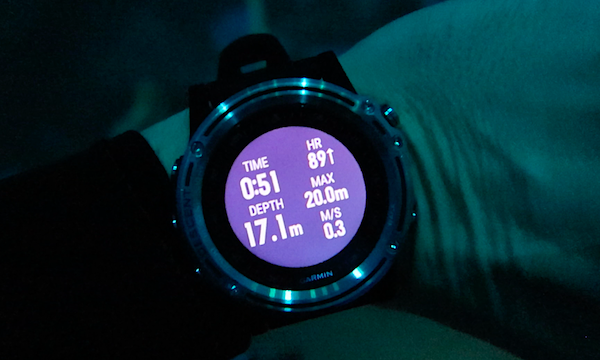 - How does the Descent Mk1 perform when diving for weeks in salt water? These and more questions will be tested within the next months. Stay updated and get my Newsletter. For further questions leave me a comment! Thank you for your usefull review. But do you also know the sample rate while diving? Is that 3 samples per second or is it adjustable? Which sample rate do you mean? Heart-Beat, Depth, Temperature? Hi Timo, thank you for your review, really useful. I would also be interested in the sample rate for depth and temperature if you know it – as I can’t find this information anywhere online! Many thanks. any update on the effect of sea water on the mk1 after a while? any corrosion or damage? did you test it during a scuba dive??? No updates so far. I’ll test it for some weeks this spring. You can read about it in my 2nd review. No scuba yet. Might happen as well in spring, but I’m more focussed on freediving. Have you tried any of Suuntos computers? Hey Fredrik! Yes I was diving Suunto for the past 10 years. So I compared the Descent with the D4i novo. Anything you’re interested in regarding the difference? 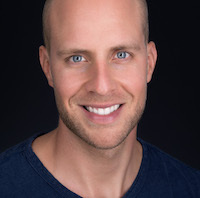 Hi Fredrik! I have a suunto D6i and for some years now and thinking about buying a descent MK1 but I wonder if its worth the ‚big‘ money? What do you think when reading the review? What is important for u? 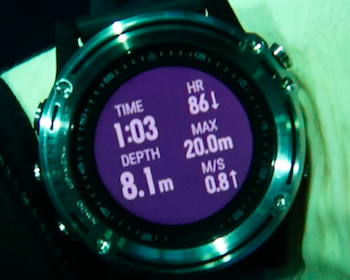 Can you test time need to fix position by GPS Just after a dive ? In case to save the position off a spot find diving a dive! Hey Jean! Do you mean if it’s possible to track the Spot where you came up via GPS. YES you can. How detail is the log for freediving ? Can I see the first second I descend I reach 2m, on second second I reach 3.5 m, third second I reach 4.5m, etc. Yes you can. If you have a look at the diagram on your phone or computer you can scroll over it and see at which second you’ve been at which depth. What is the screen displaying when on the surface. On my Mares, I have the max depth of the last dive, the previous dive time and current time. I use it to mentally compute a recovery time and to be sure I’m not doing too close or too espaced dives. Hey Ploum! You can adjust your display if you like. You can even scroll down and check more details about your last dive. For your case you can even set a surface alarm to stay on the surface for the time you need. Yep, I got one. Thanks for the review. Hi I heard from some owners they battle to get the depth to show in meter (metric) while everything else shows in meter, even when sync with device. But while diving the depth is displayed in feet. I see in your photos the depth is in meter, where would one set this on the watch? thanks for your review. Any news for Dyn tables? Is there a way to have an automatic surface recovery time (1.5x diving time for example) with alarm ? First disappointment during first dive … can’t see the max depth at all ! … send a mail to Garmin SAV about that and still no answer ! 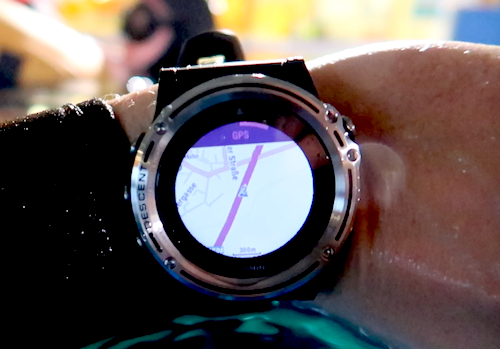 It’s great to debrief with the diving graph on you smart phone, but remember you need internet connection to access garmin connect … nothing is stored on your phone ! Well you can still access data on the watch, but let say it the screen is kinda small (compare to the graph you have on the phone ! Second disappointment and kinda sticky is how you defined the end of the dive …. if you put say 10min and do a dive of 47min the it will show 57min …. because the clock won’t stop out of the water ! so I put 20sec … but then if you get out of the water for 1min then get back to dive you’ll have 2 dives …. And now after one month used I have a sync. problem with the apply on the phone, activities will simply not sync anymore …. tried everything up to reinstall all … still not working and still waiting for a tip from Garmin ! So far, device look great, does amazing stuff, but you feel like a beta tester once something goes wrong … not what i expected for that price ! I see that these facts make you not feel comfortable in the use with the descent mk1. Did the service get back to you now? Did you update your watch already? Some of the points you mentioned could be already improved with the latest update. I see your point in using garmin connect mainly online. I’m totally with you. But hey, you can still get all the data you need on your phone with bluetooth. Did you try that after your dive? All in all, please keep up with the garmin service, it is a brand new product yes, but I see them fixing bugs quickly at the moment for the descent. Hi everyone, i have the MK1 since 3 months and i tested for tons of dives. I use it for freediving only. second disappointment is this, if i use the chronometer in swimming pool during traing, once i dive 0.5m belowe surface it automatically start a dive session and i just need to check the chrono. Hey Alessandro, thanks for your comment! i use the app on a android device, ‚cause in the garmin connect website main data are missing. 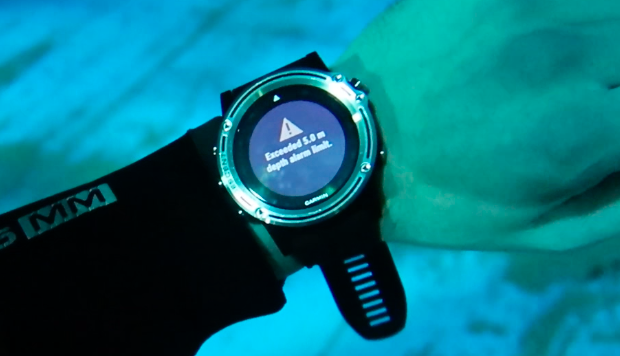 Did you check each dive in garmin connect? You should find it there in the details. on your watch you can check each dive. Via connect you can only see each dive + zooming into the whole training. Did you try to zoom into the dive you like to see? Thanks Timo for the great review, not many detailed reviews out there. After reading Alessandro’s comment I was wondering if it was possible to „zoom in“ and study individual dives (depth vs time) in the downloaded data (either in phone, watch or computer) or can you only look at the session as a whole? Hey Breathless, thanks for your comment! It is possible to zoom in the whole session. You can even see how long your surface-break was. 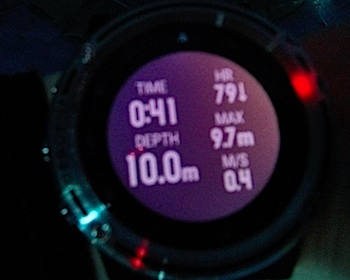 Additional to that you can check details of your dive for example heart-rate + depth + time. Even the temperature you can overlay in the graphic. This is all possible on smartphone and computer. But not directly at the watch. Interesting reviews mainly due to very few wrist computer reviews for freediving. Have you ever used Ratio iDive Free and Omer UP X1? Before I read your review I was interested in using one of these devices. But now I am interested in looking at the comparison between the three products. Happy to hear. Thanks Shawn!